For the largest selection of antique firearms and World War II memorabilia in Cincinnati, visit our store, Antiques Unique! Our gun experts are open to the public, along with our extensive selection of rifles, shotguns, flintlocks, pistols and more! Bring in your piece of American history to learn more. The history of our country has been written time and time again on the battlefield and through the years, weapon design has evolved to fit the technology of the times. Today, some of the most advanced weapons in the world are used by our armed forces, but less than a century ago, the world’s bloodiest war was fought with an entirely different brand of firearm. And though the guns used by past generations in World War II may look ancient in comparison, they serve to tell a defining story of our past. 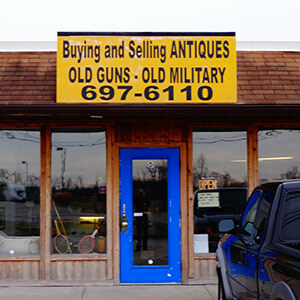 At Antiques Unique, we’re proud to showcase the largest selection of World War II firearms and other period piece antiques in Loveland, OH, keeping the stories of the early 1900’s alive in the memorabilia that we stock. We carry a vast assortment of historic antiques, along with WWII collectables. We proudly address antique and antique firearm needs in Loveland, OH and the surrounding areas. We are a proud member of the Ohio Antique Gun Collectors Association. 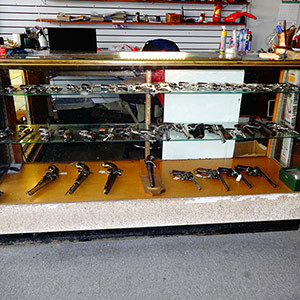 We have the largest selection of antique guns and historic collectibles in the Cincinnati. "Very friendly and helpful. Prompt service and an actual person answered and not a recording. "